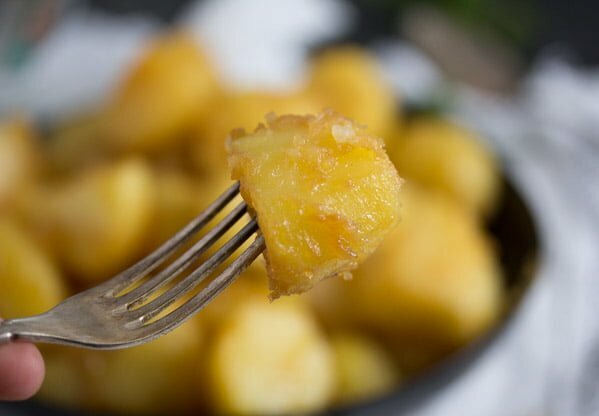 A simple and surprising Icelandic recipe: caramelized potatoes, a perfect side dish for roast lamb or other roasted pieces of meat. 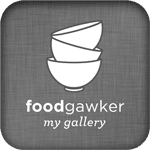 This is something I have never eaten before, I have not even imagine one could eat a caramelized potato dish. But it definitely works! OK, I know that these caramelized potatoes are a traditional Icelandic Christmas side dish, but then again, is not that we only eat potatoes at Christmas… I wanted so much to try these potatoes, I did not really care that Christmas is still four months away and that we are enjoying the hottest and longest summer in 15 years here in Germany. I am afraid I’ve never known much about Iceland and Icelandic food. I know Iceland is cold and that it is the westernmost country in Europe, I know it has volcanoes, one of which erupted not many years ago – 2010 – causing disruption to air travel in Europe, I know its capital is Reykjavik. And last year I saw a German television cooking show where a famous cook had to cook something Icelandic. What did he cook? A whole sheep’s head… He said it tasted fantastic, but to tell you the truth, I am pretty sure that I will never in my life try to cook that… I would eat it if I would get bits of it on the plate and not the whole head in front of me, but no… I would never start “playing” with a sheep’s head. Another famous Icelandic dish they were mentioning was rotten fish, I think it was shark. What I do remember is that they found it beyond disgusting, so I am very sure that I would not try that. 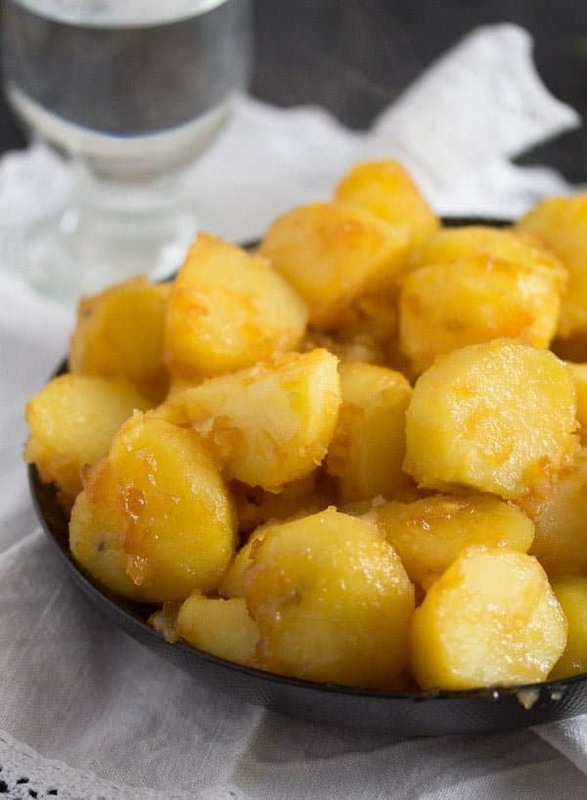 But I did want to try this side dish of Caramelized Potatoes the moment I saw the recipe. 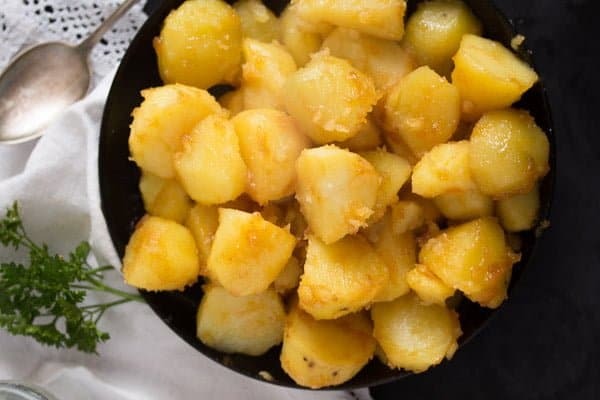 I love anything with potatoes and the idea of having them caramelized was so intriguing, I think I cooked the dish one or two days after I saw the recipe. I cannot really name a source for the recipe, there are only three ingredients, so any recipe you will find online will sound pretty much the same. Also, I had rather large potatoes, but you can choose small ones instead, the dish would look even prettier then. Step 2: Caramelize the sugar in a preferably non stick pan. When the sugar starts to get a nice and rich golden color, add the butter, stir well and let it melt. Step 3: Add the potatoes and stir very well to coat all over. 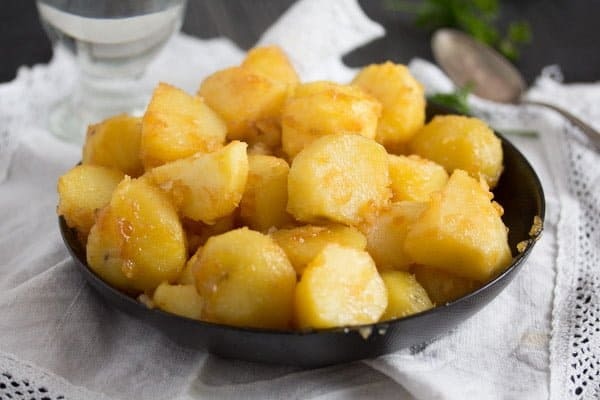 Some sources recommend eating the caramelized potatoes warm, some say they are best served cold, so you have the choice, I suppose. We had them warm and we liked them like that. I did not start to cook a Christmas meal in July, so we had the caramelized potatoes with roasted chicken legs and a simple, slightly sour and refreshing white cabbage salad. I thought the vinegar in the salad was a great contrast to the sweet sugar potatoes. A beautiful meal, we all loved it. Clean and peel the potatoes. 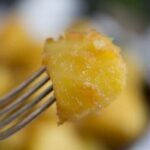 Cut them into large chunks or leave them whole if using small potatoes. Bring a pot of water to a boil. Add the potatoes and cook for about 15-20 minutes, the potatoes should be tender, but not become mushy. Drain the potatoes very well and let stand in a colander for about 10 minutes, to make sure that they are dry. Give the sugar to a non stick pan and let melt slowly, it should start to get slightly brown. At this point, add the butter and let melt slowly as well. Stir thoroughly. Add the potatoes and stir carefully, taking care not to break the potatoes. Lower the heat to minimum and continue turning the potatoes into the caramel until they are coated all over and golden. Do not let the caramel turn too dark, if you think it might happen, immediately remove the pan from the heat. Serve the caramelized potatoes as mentioned above. 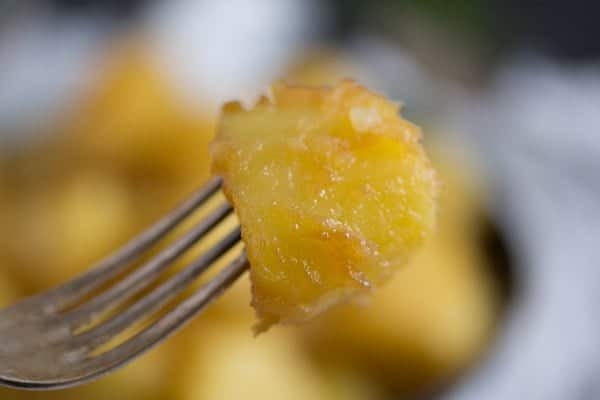 Use either larger potatoes cut into large chunks or small potatoes left whole. I have never tried cooking anything Icelandic. I think this might be a good start. 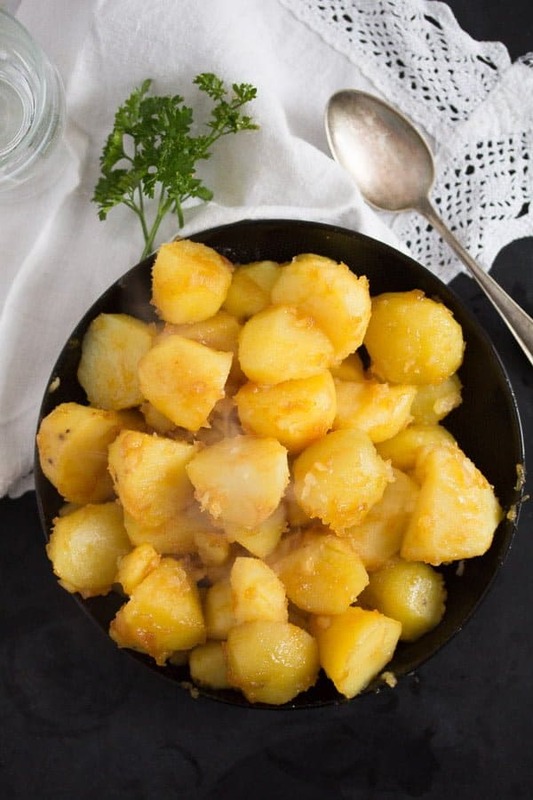 Also be it Christmas or any other day who doesn’t loves potatoes! This is new! So very easy easy and a totally different flavor than any potato I’ve ever had. Another one of your recipes I’m going to have to make.